There’s a chill in the air, conkers on the ground and leaves slowly changing to gorgeous shades of orange and red on the trees. I think it’s safe to say that autumn has well and truly arrived. Don’t let that keep you and your family cooped up inside though. This time of year is great for getting out and about, but if you’re stuck for inspiration then try some of these ideas for outdoor activities for the whole family to enjoy this autumn. I absolutely love visiting the beach all year round. It really doesn’t have to just be something you do in the warm summer months. Just wrap everyone up warm and head down to the coast for a bracing walk in the sea air. 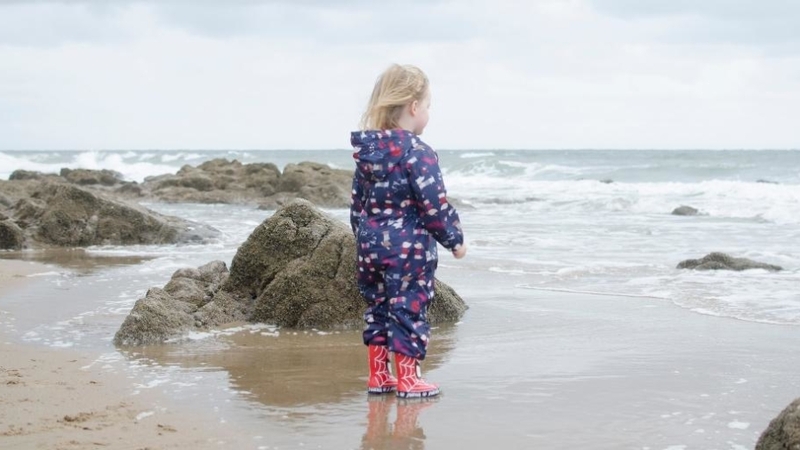 If you put wellies on then you can all still have fun splashing in the water. You can build sandcastles and dig big holes to keep warm. Or grab some shells and stones and try your hand at skimming them. Then find a good fish and chip shop nearby to warm yourselves up again afterwards! Tennis is a great option to try this time of year. In the summer Wimbledon fever tends to take over and the local tennis courts get pretty busy. By autumn though the effect wears off a bit so there should be plenty of availability to give it a go. Golf is also worth a try as a family. It’s a great way to get out in the fresh air and there are various options depending on skill levels. You can keep it really fun by hitting a crazy golf course, or you can really go for it and join a local club. If you want to take it seriously you’ll need to look into getting some clubs and it might be worth taking a look at the Callaway golf clothing available online to kit you and your family out in the right gear. We absolutely love going for walks in our local woods. Most of the time we just wander round, exploring different routes and finding interesting landmarks from when there used to be coalmines in the area. What you can do though is make a list before you go out of things to look out for and find. Things like acorns, conkers, and different coloured leaves. Or you could take a look and see if there are any special trails you could visit. 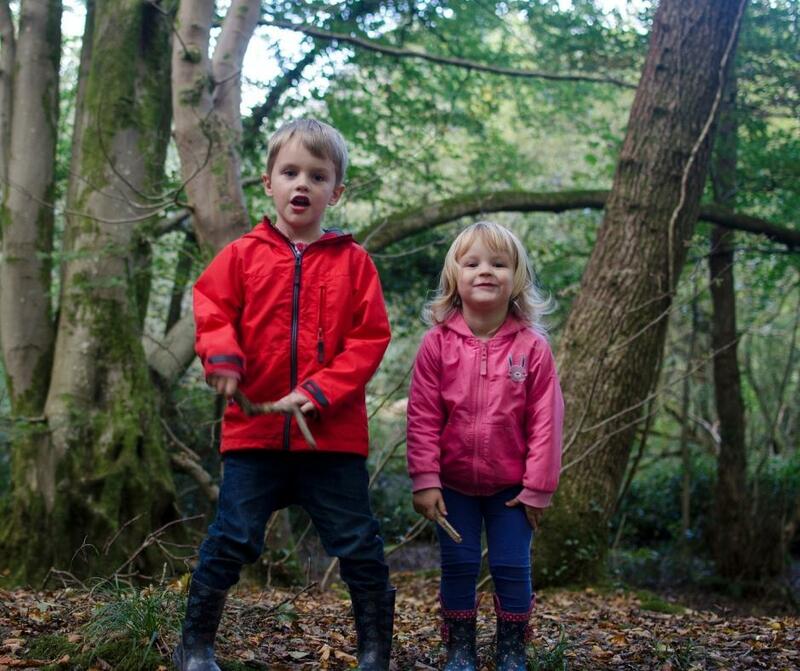 I’ve heard about Gruffalo trails in a few different woodland areas that look like so much fun! In other words, go out and pick some of the yummy blackberries that are everywhere this time of year. You can go to an established blackberry farm if you want to, where you can pick blackberries and other fruits and pick up some other bits from the farm shop while you’re there. Or you can go the DIY route and just go out for a walk in the countryside with a tupperware pot and collect what you can. Then head back home a cook up a delicious blackberry crumble. 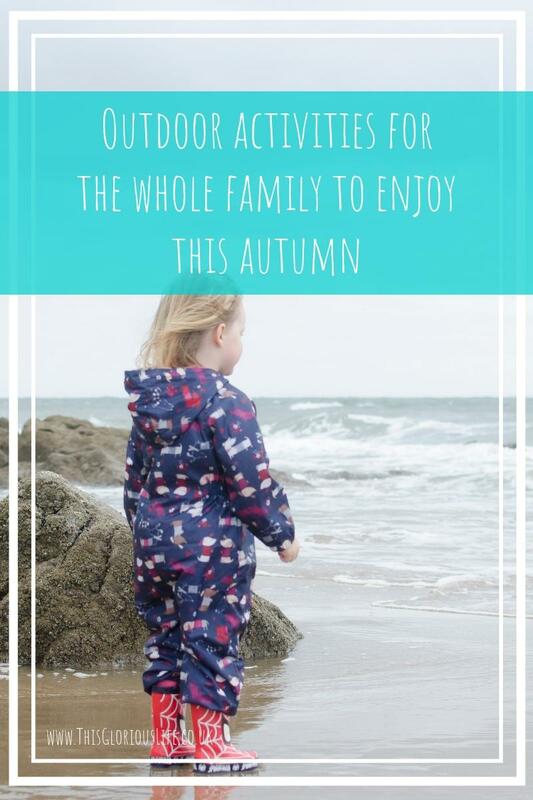 Hopefully this has given you a few ideas for ways to get out and keep enjoying the great outdoors with your family this autumn. What are your favourite things to do outside at this time of year? Have you ever had a great idea, or thought about trying a new sport or hobby, but then talked yourself out of going for it because you were scared that you’d fail at it? I think we’ve all been there at some point. The fear of getting things wrong, making mistakes and failing can stop us in our tracks. Quite often before we’ve even started. But the thing is, we’ll never do anything or achieve anything if we’re so scared of failing that we don’t even try. 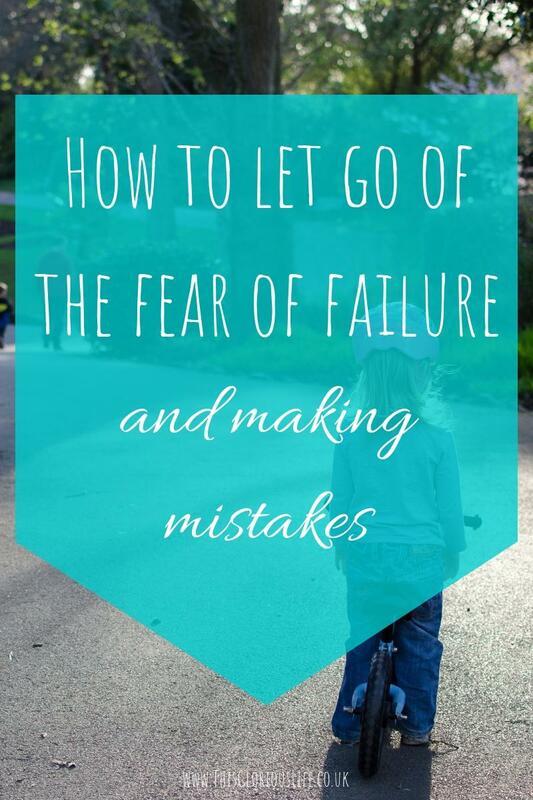 Here are some tips on how we can all let go of that fear of failure and stop worrying so much about making mistakes. We all seem to think of failing as something really bad. For some reason we seem to believe that we always have to get everything right. I’m not sure when this happens though, because if you look at babies and toddlers you can see that fear of failure and getting things wrong isn’t something we’re born with. Toddlers learning to walk don’t have this fear. They fall time and again, but each time they get back up and try again until they can do it. We need to get back that mindset that in order to grow we need to allow ourselves to fall, to fail, to make mistakes. One way to change our way of thinking about mistakes is to make a few on purpose and see that it’s really not as bad as we think it is. Now I’m not saying you should go and mess up a deal at work on purpose that would lose the company a fortune. I’m saying look for something small and safe that you could fail at or do badly. If you work in an office then maybe you could skip that optional meeting that’s just not important to your role. Find something small, mess it up and see if the consequences are really as bad as you think they’ll be. Chances are the impact of you failing will be less than you think it’ll be, which will then make you a bit less scared of making mistakes in the future. If you’re still feeling scared then try looking into other people’s failures. Some of the world’s greatest inventions came about either because someone made a mistake, or because someone failed again and again until they got it right. From penicillin and post-its to the light bulb and artificial sweetener, all sorts of things have been discovered and invented by mistake or after repeated failures. Athletes and sports stars are also great to look at to realise that success so often comes after multiple failures. Michael Jordan once said, “I’ve missed more than 9,000 shots in my career. I’ve lost almost 300 games. 26 times, I’ve been trusted to take the game winning shot and missed. I’ve failed over and over and over again in my life. And that is why I succeed”. It gets a lot easier for us to make mistakes, and fail at times, when we create an environment where these things happening is OK.
A while ago I wrote a post about the things I’d like my children to say ‘yes’ to, and failure is one of the things on that list. I think it’s important to let our children know that it’s OK if they try things and get it wrong. Or if they take a risk that doesn’t quite pay off. We should let our children know that they won’t get in trouble if they make a mistake or if they try and fail at something. I think for most of us the idea of making a mistake or failing at something will always be a little bit scary. For some people it can be so scary it stops them from ever trying anything new. It could be that you have mental health issues to work through in order to let go of your fear, in which case talking with a counsellor at thrivetalk.com could help. As a general rule though, we can take steps to move past this fear ourselves. The more we try things and push ourselves and allow ourselves to get things wrong, the more we’ll realise that it’s nowhere near as bad as we think it will be. And the best way to learn and improve at anything is to fail along the way. In the summer I managed to get together with my brother and my sister and their children. It was so lovely to see all the cousins together, getting on really well and just enjoying each other’s company. What really struck me though is how old they’re all getting. The older two suddenly seem so much more grown up, and it sort of hit me that they’re really not far off becoming teenagers. I was chatting to my mum about it afterwards, about how hard those teenage years can be and how I wish there had been more information available when I was younger. I think a lot of my knowledge about typical teenage things like crushes, skin care and make up was pieced together from copies of Just 17, episodes of Heartbreak High and chats with my sister. I would have loved to have a book that covered everything I could want or need to know to navigate those tricky years. So when I was asked if I would like to review a copy of a book just like that I jumped at the chance, thinking if it was good I would be able to pass it on to my sister for her daughter. Honestly though, now I’ve read it I’m almost tempted to keep it, it’s full of such good advice! 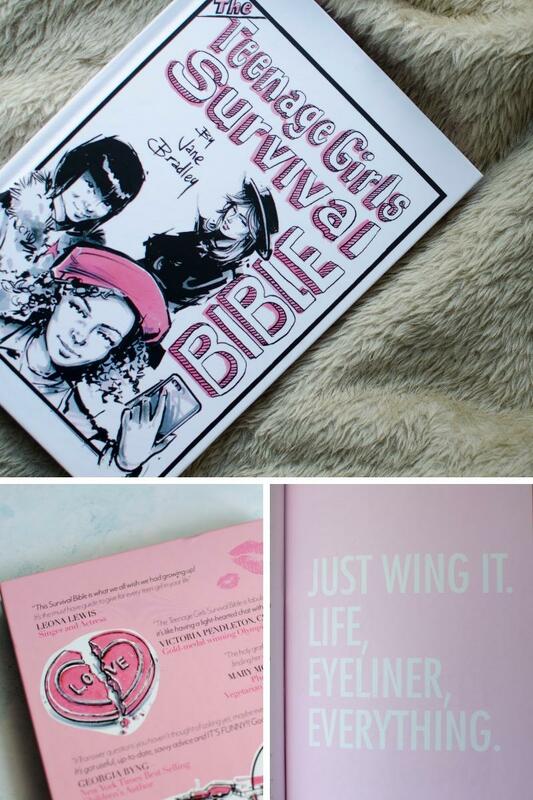 The book is called ‘The Teenage Girls Survival Bible‘ and is written by make-up artist Jane Bradley. The book covers pretty much every topic you can think of that might be helpful to teenage girls. 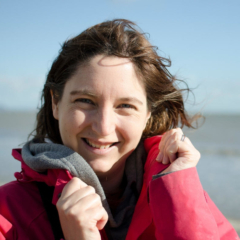 The first chapter is called ‘It’s all about survival’ and covers things from staying safe when you go out to advice on coping with panic attacks. There is also a good amount of information in this chapter about alcohol, smoking and drugs. It’s very real, and lists out all the dangers and harmful side effects, which will hopefully help girls to really think about whether it’s really worth experimenting with these things. The other chapters in the book tackle a whole variety of things, all broken down into themes. 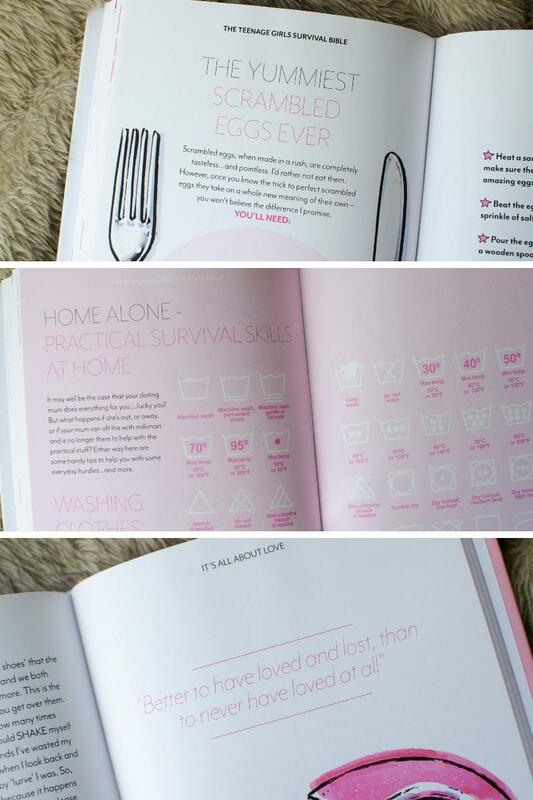 The book also covers really helpful, practical things like washing and caring for your clothes, and a few basic recipes for cooking at home. I really love the way this book is written. It’s not patronising at all, and instead comes across as if it was written by your older sister who just wants to give you honest, real advice on life. The text is broken up nicely so the information is there is bite-size chunks which makes it much easier to read and to find the information that you really want. There are fun, vibrant illustrations throughout that have an almost 90s vibe which I love. It actually reminds me of my old copies of Just 17 in a way! This book is just what I would have wanted as a teenager, it’s fun, informative, and covers all sorts of things that I might have been embarrassed to ask my mum about. 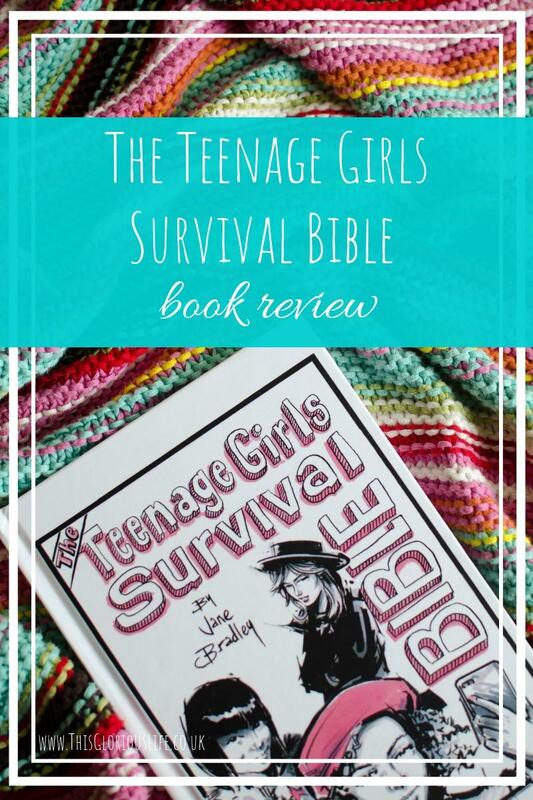 If you have a teen or even a pre-teen in your life then this book would make a really great gift, it’s the type of book that will be referred back to again and again. 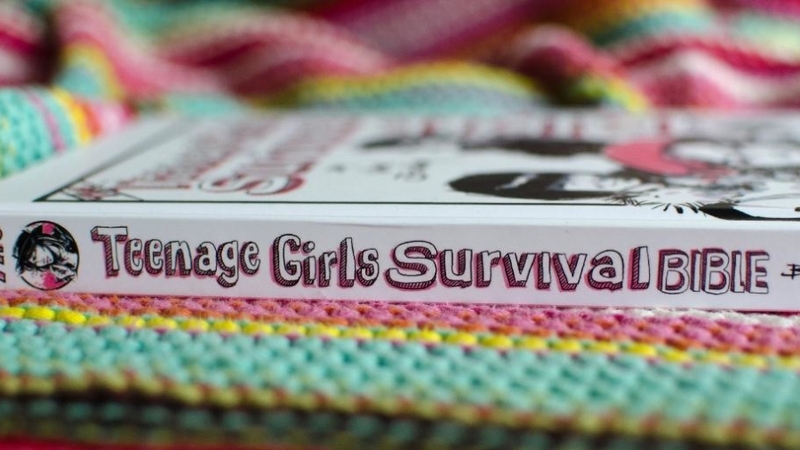 You can get a copy of The Teenage Girls Survival Bible from Amazon. Disclaimer: I was sent a copy of the book for the purpose of this review but all words and opinions are my own. It’s a common scene up and down the country. Those poor parents facing the morning chaos as they try and get their kids out of bed, into their school uniforms, and out of the doors before the morning whistle blows at school. Oh, and let’s not forget trying to squeeze in breakfast as well. Tough? Those people who aren’t parents don’t know the half of it. 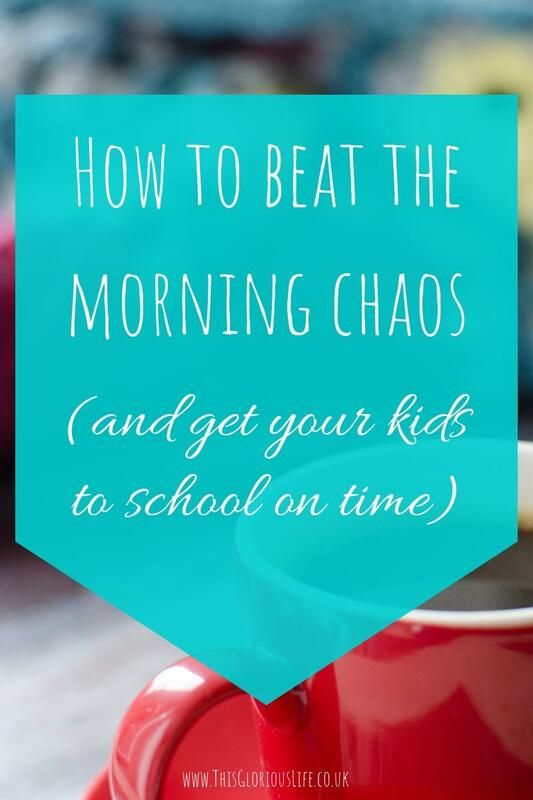 So, if you’re looking to avoid morning chaos in your household, here are some tips I think you will find useful. Get your kids to bed on time. It’s common sense, but the more time your children have to sleep, the easier it will be to get them out of bed in the morning. This means ensuring they cut down on screen time before they hit the pillow, refusing to let them stay up a little bit later for whatever reason, and offering a little bit of incentive, such as reading them a story when they are finally tucked up in bed. Organise the children’s things before you go to sleep. The more you can do the night before, the less you will have to do the following day. So, ensure you have the school uniforms out and ready, set the table for breakfast, and ensure the kids have what they need in their school bags well ahead of time. The more prepared you are, the less chaos there will be, especially when your child is complaining that they can’t find their shoe, or can’t find the book they need for their school day. If your children are in the habit of ‘sleeping’ through their alarm clocks, you need to be ready to wake up to yours. Go to bed at a decent time, set your clock for an hour before your children have to get up, and you will give yourself a fighting chance when the new day begins. Getting up before your kids will give you time to manage your tiredness. You will have time to eat your breakfast, without worrying about your children’s demands. You will have time to take part in a little exercise, ensuring you have a buildup of energy to cope with your children. 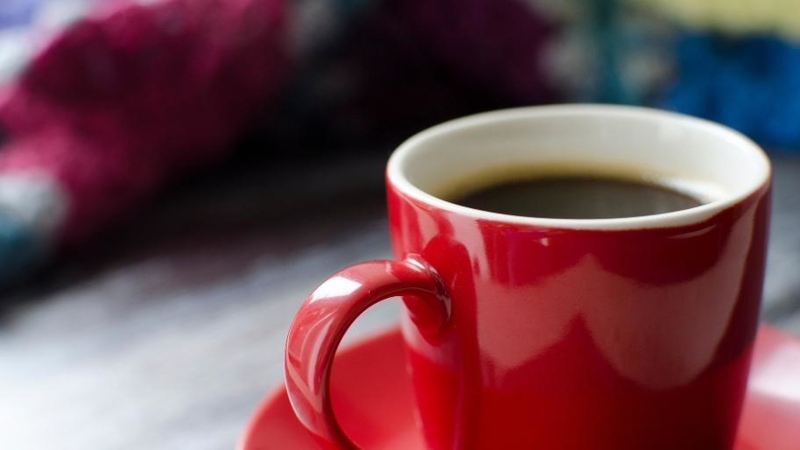 And you have the time for a coffee, to give you that final spurt of energy you need for when you have to get the kids out of bed. Learn about coffee subscriptions here to ensure you never run out of your caffeine supply when you need it the most! Teach your children the skills they need. 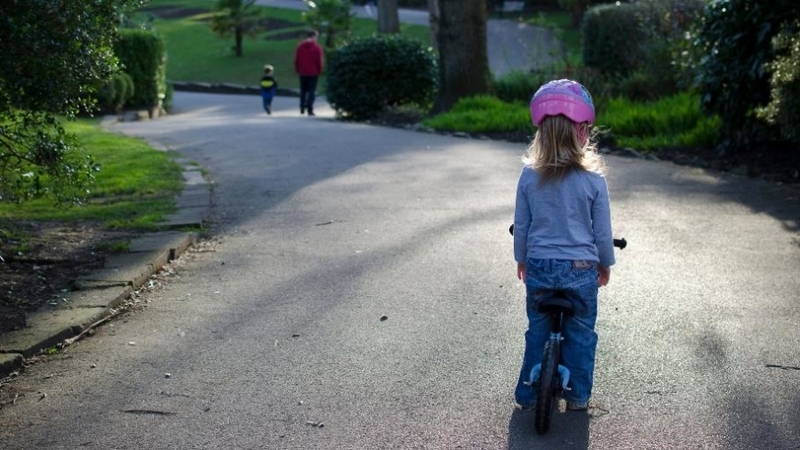 By giving your children responsibility for looking after themselves, the less there is for you to do, and the greater chance of them being ready on time. While you might still want to do a few things to hurry them along, such as making their breakfast, you can still teach them how to dress themselves, such as tying their shoelaces and putting their coats on, and then give them lessons on how to hurry themselves along with their routines, such as when they are busying themselves in the bathroom. And by doing all of these things, the less chaotic your morning will be, and the less risk of your child being placed on the ‘naughty list’ for being late at school again. Well, that’s the theory anyway, but I hope this advice has helped. Let me know your thoughts, and tell me how you survive the morning chaos in your household. How often do you sit down and eat as a family in your house? I know it’s something my family and I don’t do often enough. With the children ready to eat almost as soon as they get home from school, eating dinner together during the week just doesn’t work for us. We try to sit down together for a meal at the weekend but even that doesn’t happen as much as it would in a perfect world. There are so many benefits to eating together as a family, but it seems to be something that doesn’t happen often enough for lots of families. 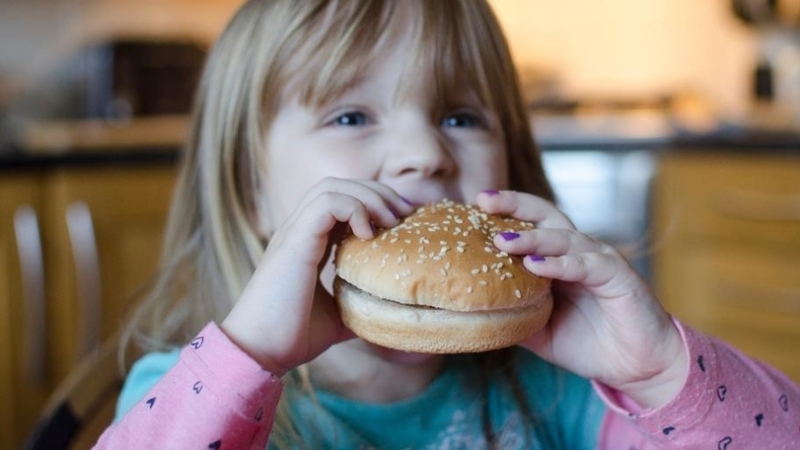 Furniture village recently commissioned a survey that looked into mealtime habits in the UK, and the findings are really interesting. Only 22% of the people asked said that they ate their dinner at the table every night, while 53% said that they eat on the sofa more than anywhere else. What they also found though was that 70% of the people they asked said that they believed family relationships were strengthened when everyone sat at the table and ate meals together. It can be hard to find the time though, and when you do have the chance to do it sometimes family meals can be stressful with fussy eaters and no one really talking to each other. 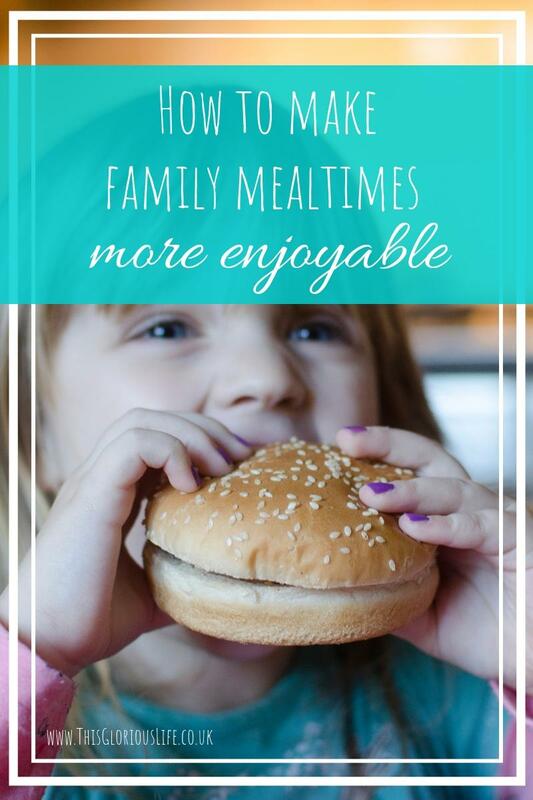 Hopefully these tips will help to make family mealtimes more enjoyable for everyone. It’s easy to feel a bit hard done by if you’re the parent who sorts everything out for family mealtimes. So get the children in on the action to share the load a bit, as well as get them more interested in the food they’re going to be eating. You can make the dinner table a happy, fun place for everyone to spend time together by playing a few games during mealtimes. Would you rather? Ask your children age-appropriate questions like “would you rather be the teacher at school or a student?”. You can ask really silly questions or more serious ones, depending on the mood everyone is in. Who am I? This is a game we play in the car sometimes. One person thinks of someone (normally someone we know in real life) and the others ask them yes or no questions to try and work out who they’re thinking of. What am I? This is basically the same game, but you think of an object rather than a person. Carry on the story. One person starts a story, along the lines of ‘once upon a time there was a little girl with blond hair’. Then the next person makes up the next line of the story, and then go around the table with each person adding more to it. The aim really is to make the story as silly as possible. ABC. Think of a topic like countries or foods or people’s names and then go around the table coming up with an answer for each letter of the alphabet. If you’d rather chat with your children than play games, then you can start a conversation by asking what the best and worst parts of their day were. If a genie granted you a wish, what would you wish for and why? If you could pick a new name for yourself, what would it be? If you were a superhero, what would your special power be? If you could only eat one food for the next week, what would you chose? 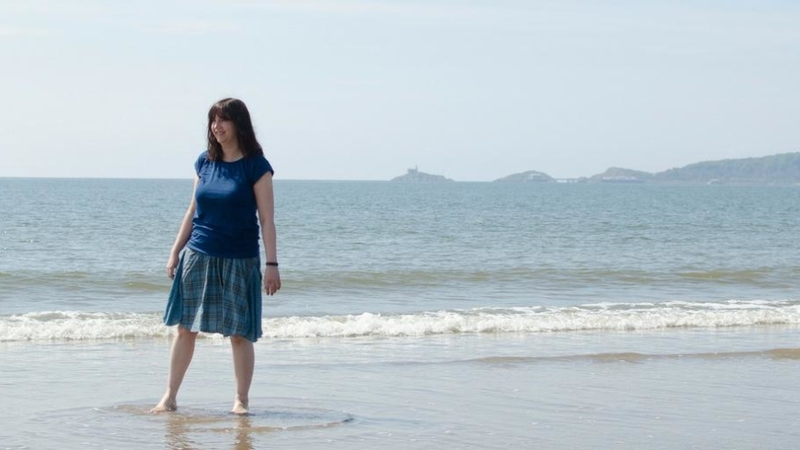 If you could visit the setting of any book or tv programme, where would you go? The great thing about these kinds of questions is they’re quite fun for the adults to answer too. I know these ideas won’t magically solve issues with fussy eaters or get fidgety little ones to sit still and eat their food. There are always circumstances that make mealtimes stressful and no fun for anyone involved. Hopefully though these tips will help to get children more interested in sitting down together. They might distract them enough that they’ll put more food in their mouths without a big fuss. They might engage them enough that they’ll stay sitting at the table that bit longer. Do you have any other tips to make mealtimes more enjoyable for the whole family? Along with countless other parents I recently watched my baby head off to big school for the first time. It’s been a pretty big change, but we’re quite lucky really because, while the situation is new, none of us feel like we’re new at the school. Rhys has been there for years now and Nerys is well and truly settled in with her classmates after getting to know them all in Rising 3s and Nursery. I do remember how it felt at the start though. The anxiety of what it will be like at the school gates. Wondering if anyone will actually talk to you or if you’ll be left out of all the cliques that you always hear about. 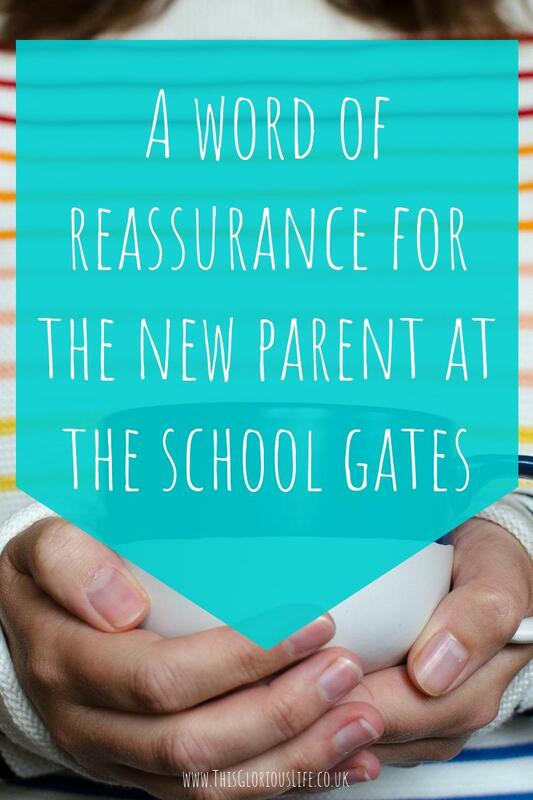 So for anyone who is going through that at the moment, for all the new parents heading to the school gates for the first time, here are a few words of reassurance for you. First and foremost, don’t believe everything you’ve read online so far. There are all sorts of posts out there about the 5 (or 10 or however many) types of mum you meet at the school gates. 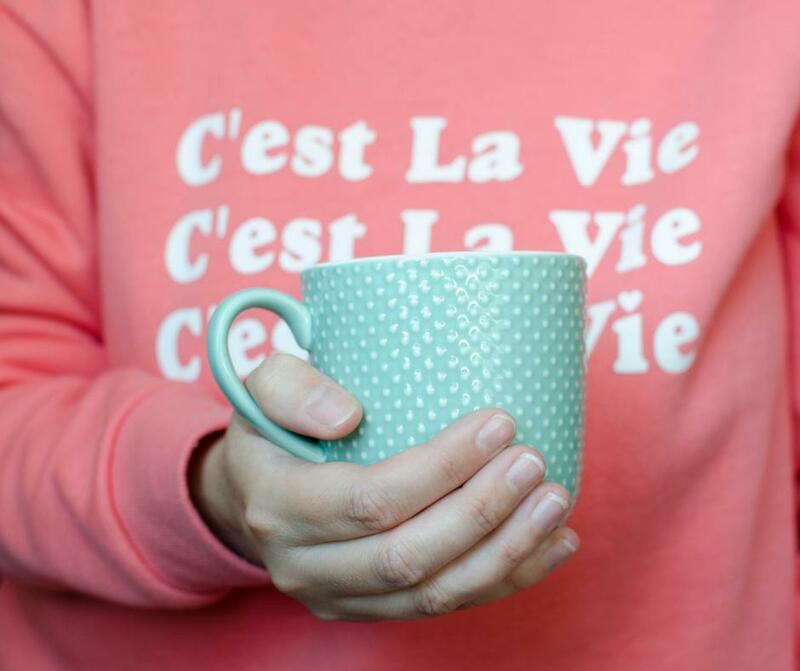 Posts that talk about the cliques that form with the working mums, the hippy mums, the hot-mess mums, and so on. And if you don’t feel like you fit any of those descriptions it can be quite worrying thinking about where you’ll fit in. And it must be even worse for the dads out there at times. Don’t let these posts fool you; I’ve been doing the school run for over 4 years now and can honestly say I’ve not come across any of these stereotypical cliques. People do naturally form little friendship groups but I’ve found that everyone has always been more than happy to chat with everyone else. There’s no queen bee waltzing around making everyone else feel bad about themselves. There’s no fashionista group standing at the gate judging those of us in jeans and hoodies. There are just mums and dads trying to get their children to school on time. Smile. Even if you’re feeling really anxious, give people a smile if you catch their eye. Use your children to help. If you can see who they’ve made friends with, take the chance to say ‘hello’ to that child’s parents. Don’t worry about what you’re wearing. Honestly, unless you live in a super stylish part of the country, just wear what you want. Just steer clear of anything that might embarrass your children. Look for other parents who are on their own. It can be really intimidating to approach a group of people who are chatting, so find someone else on their own and go and say hi. Go online. Find out if there’s a Facebook group for your child’s class or yeargroup. We have one for both Rhys’ class and Nerys’ class and it’s been a great way to get to know the other parents a bit better and keep up to date with class news. Give it time. Keep it mind that it can take time to get to know the other parents and for friendships to form. Don’t rush things. Don’t take things too personally. If someone doesn’t return your friendly smile, or rushes off as you try to say hello, don’t immediately assume it’s about you. There could be a million reasons behind it. Everyone at the school gates is busy, trying to keep track of their child, wondering if they put the signed form back in their bag, planning their hurried route to work as soon as the door opens and their child goes in. Join in. If you really want to get to know people you can think about joining the PTA. It can be quite a commitment but also a great way to get involved with the school community. It can be quite intimidating for the whole family when your child starts school. And I know that at our school it can feel pretty manic in the mornings around the classrooms, as everyone tries to get to where they need to be on time. And it can be hard to strike up conversations and get to know people. The afternoons at pick up time tend to be a bit calmer and there are often more chances to say hello and chat with the other parents. So keep that in mind when you’re thinking about trying to strike up a conversation. Other than that, just smile, be friendly and give it time. I had a cuppa and a catch up with a friend the other day. We hadn’t seen each other for a month or two and it was really lovely to chat and get up to date on what’s been going on in each other’s lives. That evening I was talking to my husband about it, and how it had suddenly occurred to me that we had been friends for around 7 years now. It just felt like such a long time ago that we met as exhausted first-time mums at the local NCT baby group. And it was so lovely to think how our friendship has developed and how openly and honestly we can talk to each other about things. It makes me so glad that I pushed myself to go to baby group all those years ago. That I stepped out of my introvert comfort zone and started making small talk with the other mums there. I know a lot of introverts really struggle with small talk. For me it’s more about social anxiety but I know for others it’s about wanting to go deeper than small talk and chit-chat allows. The thing is though, you have to go through that small talk phase to be able to build relationships and make friends. 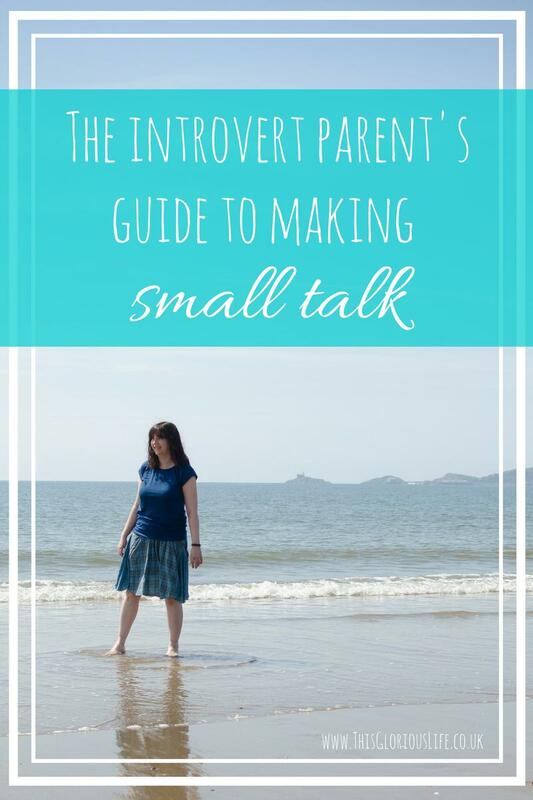 So, here is my guide to making small talk for introverted parents. Whether you’re a brand new parent heading to baby group or you have older children and want to get to know people at the school gates, these ideas will help. Take a deep breath, this is the hard part for so many of us. If you see someone you want to chat with then you’ll need to find a way to break the ice and get the conversation going. Jennifer Latson, author of ‘the boy who loved too much‘ suggests a three-step approach to greeting people. Compliment them. It can be as simple as saying how much you love their baby’s name, or how happy their child is going into school. Ask about their well-being. You can go with a simple, ‘how are you today?’ or go a bit further and ask if they were struggling with the morning rush to get to school on time like you are! Choose a topic to chat about that is relevant to them. This is pretty easy if you have children the same age, you can just ask their thoughts on any issue you’re dealing with at the moment, or how great different parts of being a parent are. This is a classic way of getting conversations flowing. People quite like to talk about themselves, so showing interest and asking questions is a great way to start chatting. The trick though is to steer away from ‘yes’ or ‘no’ questions which can stop a conversation in its tracks. One way to do this is to ask ‘why’ questions instead of ‘what’ questions. So at baby group you can ask someone their baby’s name, and then keep the conversation going by asking if there was a reason or special significance behind their choice. If you find it hard to think of questions to ask, you can just wait for them to ask you one and then ask the same one back. Ask their name (not just their child’s name) and use it when you speak to them. When we’re used to being called ‘so and so’s mum’ that it feels quite special when someone makes the effort to call us by our actual name. 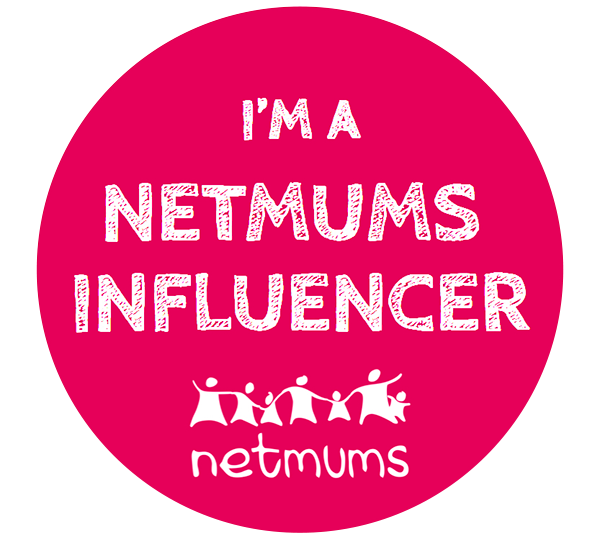 If you’re sitting with a few other mums at baby group or at the school gates then make sure to bring everyone into the conversation. If you notice that one parent in particular seems to be left out, make a point of directing some questions to her and making sure she’s ok. Ask fact-based questions to start a conversation. At baby group ask if they know what time it finishes, or if there are any other nice groups that they know of in the area. At the school gates you can ask about homework, or events that the PTA are planning. You could ask if they know which swim school is best to go with locally, or if they know of a good karate or ballet class. There’s something about complaining together that brings people together. And while being a parent is wonderful there are also lots of things that we can complain about, all of which make pretty good topics of conversation. Lack of sleep, teething and weaning troubles are good things to complain about together when your baby is little. As your child gets older then there are bound to be all sorts of school related issues that you can bond over. It can be as mundane as complaining about the fact that it always rains during the school run, it will still break the ice and get you chatting. I know for a lot of introverts small talk is painful. You want to go deeper than chat about the weather. 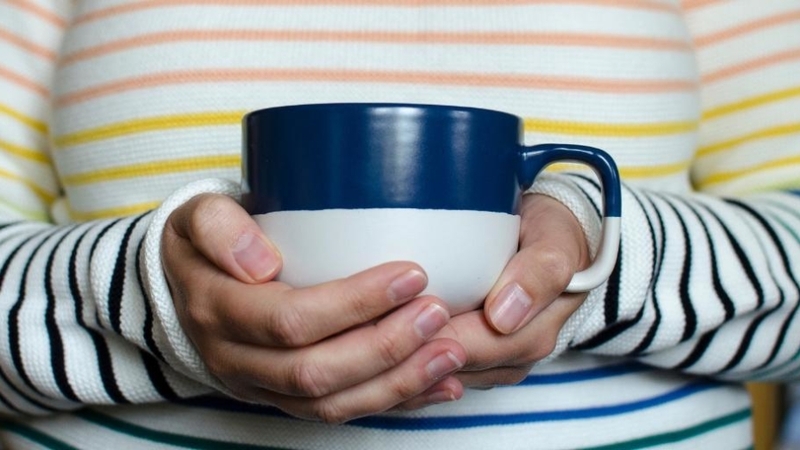 But you have to go through the small talk stage to connect with people and move on to the next level, so hopefully these tips will help make the process a bit easier.